This design can be considered a variation of the design Welcome Bride Home. The “constructions” of these two cards are similar. Yet, the graphical elements are different. 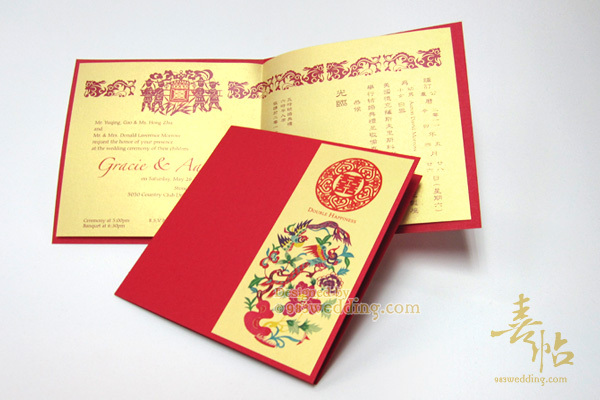 It will suit brides and grooms who would like a red color Chinese touch to the wedding card. Without any surprise, the color scheme of this design is red and gold. 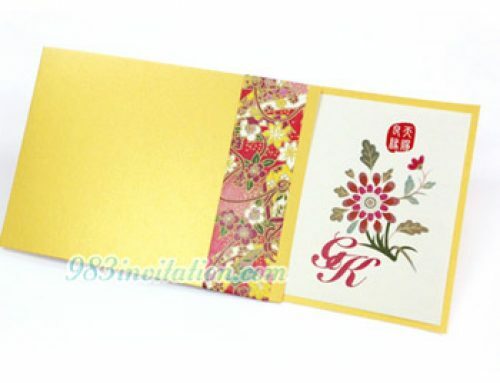 This is the way to deliver the sense of being a more traditional Chinese wedding card design. There are two birds dancing to celebrate that the couple will be united in love. 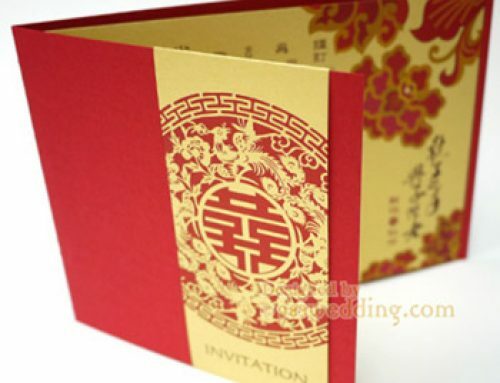 They are printed on the golde color strip glued to the cover of the invitation. Besides the lovely dancing birds, a double happiness symbol, with the words “double happiness” are printed on this strip. The symbol and the words are all printed in red. 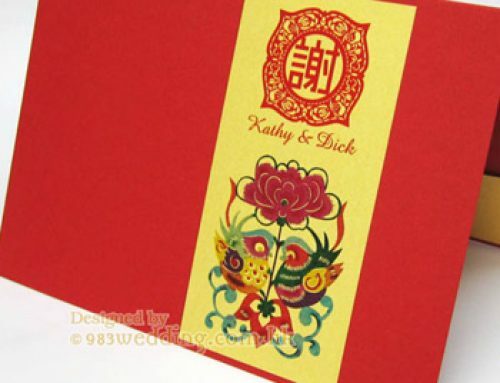 It is a perfect option if you are going to have an Asian or Chinese themed wedding. The bold red color will amaze your guests. Guests will remember this invitation for years. In fact, the main difference between this new card and the original design is that the paper cutting patterns printed on the gold color strip are different. Both patterns are depicting two birds singing to celebrate the wedding of the bride and the groom. However, they are drawn in two different ways. They are two different paper cutting patterns. We also aim at making the insert look elegant and exquisite. The paper stock chosen for the insert of this design is gold in color. Again, it is a traditional color in Chinese weddings. We do not just print the wording on it. Instead, you can see beautiful graphics printed on it as the upper border. The wording is printed in dark brown color. 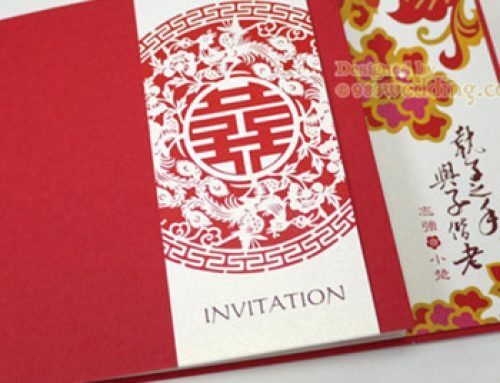 If you want a bilingual wedding invitation, you can easily have two different languages printed. 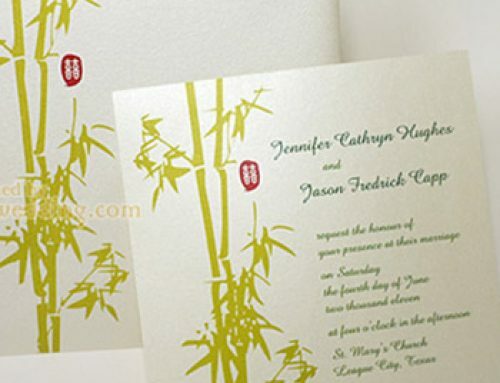 Both the original design and this version will fit your needs when you opt for an oriental themed wedding. They are elegant and lovely. You can make your choice based on your own preferences and taste. It is true that you can also consider making some changes to it. It is the aim of every couple to make their invitation unique. We understand that you may want to personalize the design. If you would like to make changes to the insert design, you can contact us so that we can work it out on how it can be altered. 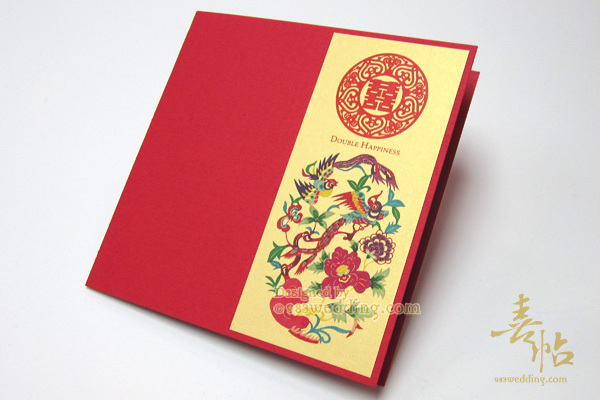 210gsm red color paper mounted with 250gsm gold color paper with the insert in full-color printing on ONE side.